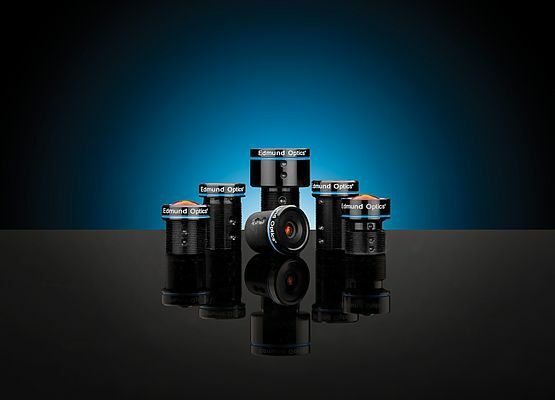 Edmund Optics introduces new TECHSPEC® Rugged Blue Series M12 µ-Video™ Lenses. These are versatile lenses featuring high resolution designs. They are optimized for machine vision working distances. They are ideal for calibrated imaging applications such as measurement and gauging, 3D stereo vision, robotics and sensing, autonomous vehicles, and object tracking. The lenses are stability ruggedized, which protects the lens from damage. Stability ruggedized lenses also reduce pixel shift and maintain optical pointing stability after shock and vibration, which can be common in machine vision applications. Each of the M12 lenses is composed of several precision glass optics that are glued together in place, inside of a compact aluminum housing. By securing the glass optics with glue, any small movements are prevented, therefore avoiding any pixel shift within the system. Further, object-to-image mapping is maintained, even after a heavy shock or vibration. This means that the center of the object will map onto the center pixel and will always continue to map to that same center pixel. M12 x 0.5, S-Mount is used for the lenses and they are available in aperture options ranging from f/2.5 to f/8 and focal lengths from 3mm to 25mm. The RoHS compliant products feature a maximum camera sensor format of 1/3 inch and a working distance of either 100-400mm or 150-400mm. Edmund Optics® (EO) is a leading global manufacturer and distributor of precision optics, optical assemblies and imaging components with headquarters in the USA and manufacturing facilities in the U.S. and Asia and sales representatives in Germany (Karlsruhe) and additional sites around the globe. With a portfolio of more than 29.800 products, EO has the world’s largest inventory of optical components for immediate delivery and offers products, standard or customized, in small quantities but also in volume for various industries. With a global team of experts in optical design and manufacturing, EO is ready to support any projects – from design, to prototype to serial production. In addition, EO offers special programs for Research and Universities and pro-actively supports StartUps to accelerate their business. Learn more and contact us today! Please also ask for our latest catalog, we are happy to send it to you!